Most generation live in small apartments and homes because it’s what they can afford. People looking for intimate and the cozy room can use dark, dramatic lighting, warm tones, upholstered pieces, snuggly, soft and the small corner as a tremendous private space. To make the room appear you can make some decorating changes. Clear out the clutter by arranging and removing unused stuff and putting them in one place or a box to make space’s view feel open and orderly. Hidden storage can be utilized to store lying around clutters. Move furniture out of the way from walkways to open space and make the room appear big. Replace big furniture pieces with short ones like the open armless chair, and ottoman. If you have a king or queen size mattress perhaps downgrage to a smaller comfortable mattress. You can also pull the furniture away from the way to create the illusion of extensiveness. Place tall pieces along the wall rather than in the open. Chose light soft colors on the wall and floor to make the room feel more airy and open. Choose statement art décor and furniture that will fill the space. Use colors in the same family that has same color intrigue that goes in line with delicate tonal drapery fabrics, textured wall finishes and tone woven covering fabrics. Mount shelves close to the ceiling to draw the eye in an upward direction. Stick wallpaper or paint on the ceiling to make the room taller. To create more depth and space in a room it is recommended to leave your windows uncovered. Dramatic large and bold art piece can be used to make a room feel more expansive rather than having gallery wall pictures. Lucite and glass mirror provides added function of not taking too much visual space and creates an illusion of more space. 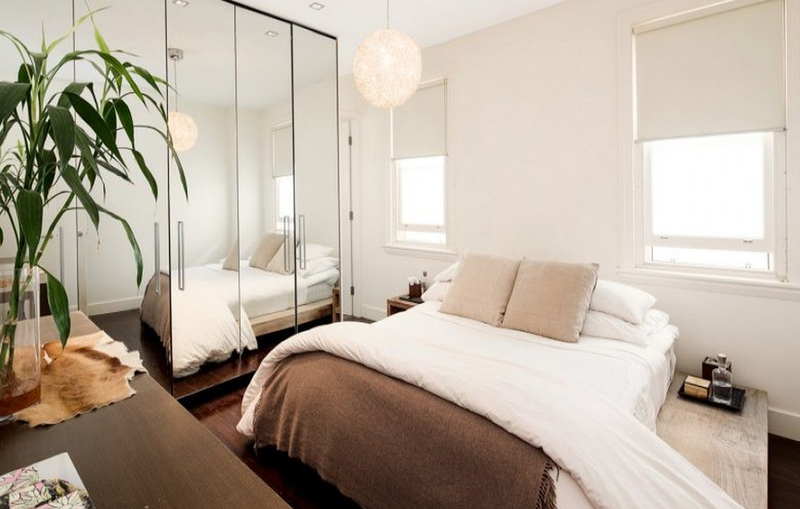 Use large framed mirror on a wall to make the room look larger and more stylish. Use few smaller lamps to allow light to spread throughout the room rather than using harsh top-down lighting. Coordinate the wall and the furniture color. You can use rugs to separate a room into smaller space parts. Use clear frameless glass in your bathroom or something you can see through. This entry was posted in Bedroom. Bookmark the permalink.